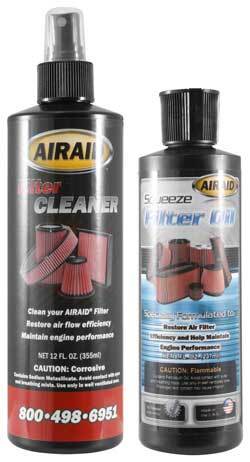 The AIRAID Air Filter Renew Kit cleans and re-oils your AIRAID premium air filer. AIRAID Cleaning Solution is uniquely formulated to clean without damaging the gauze filter media. AIRAID Performance Oil is applied after cleaning and forms an additional line of defense against dirt without limiting airflow. Clean your AIRAID filter every 30,000 to 50,000 miles for normal driving, or more often for off-road and heavy dust conditions. Everything came as expected and the product was easy to use.